Kathi received treatment at Healthy Nail Laser Center – These are her results. 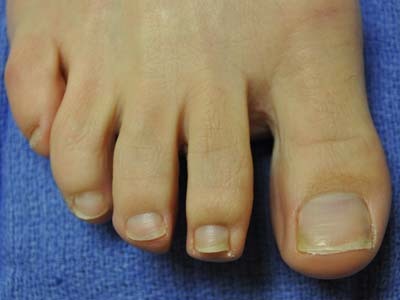 [testimonial image=”http://www.healthynaillasercenter.com/wp-content/uploads/2013/03/smcurgrarr.png”]I’ve dealt with nail fungus for 10 plus years. I would highly recommend to anyone who has the same issues. It was quick, painless & I had amazing results! [one_third_last]After 5 years, Merry found a cure with Dr. Jonathan Fisher at HNLC. This is her story. 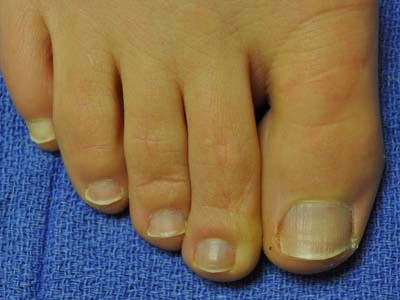 “MY TOE FUNGUS, MY TESTIMONY We’ll go back about five years ago when I noticed my left great toe had a yellowish color under the nail. I didn’t think much about it at first other than I thought I must have bumped it causing the discoloration. After a short period of time I noticed the yellow was not turning back to pink like I thought it should and that the other four toes were also turning yellow. I thought it was about time to seek medical help. I saw my family doctor who advised me that I had a fungus growing under the nails and I could take pills for the fungus, but over time they could cause liver damage plus I would have to have a blood test every month testing the liver. That concerned me quite a bit. 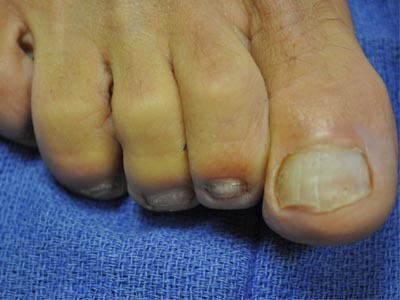 I thought there must be an alternative so I went on line and discovered there was a doctor in Minnesota that performed laser treatment for toe fungus. I was ready to travel to Minnesota for the treatment when my husband said that I should look closer to home first. 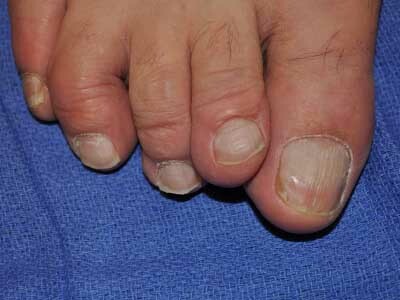 This Healthy Nail Laser Center patient is very happy with his new healthy nails. 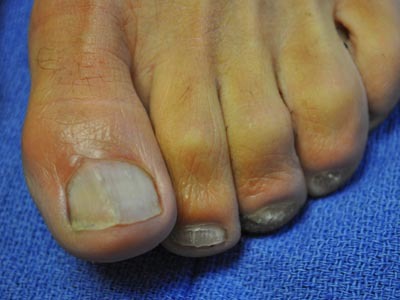 With the eradication of the fungus and the growth of new nails, the patient’s toes are able to heal and to begin growing strong clear nails. The downside to waiting too long for laser treatment is possible permanent damage to the nail’s bed. 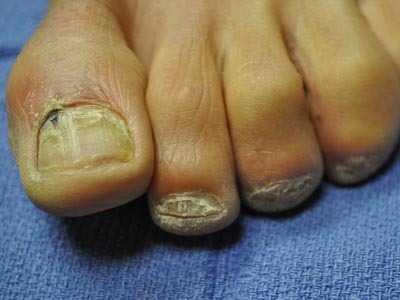 While the fungus is gone and the nail is now growing in and healthy, putting off treatment can create a different shape to the nail. Early treatment is important. 15 years of ointments and home remedies didn’t work. Just two treatments (second treatment is free) at Healthy Nail Laser Center worked! 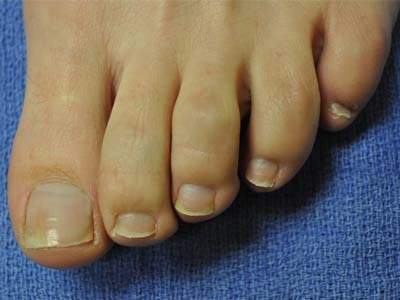 Immediately after the first treatment, the fungal growth stops. New healthy nails begin to grow out, and over time we see healthy pink nails growing in and the brittle, discolored nails grow out and are trimmed off.